Lunch will be served after Mass and burial will take place at Ft. Custer National Cemetery at 2:30 pm. Age 97, passed away November 1, 2017 in Kalamazoo. Bill was born September 15, 1920 in Minneapolis, MN, the son of William and Evalyn Barry. Bill was a veteran of World War II and the Korean Conflict. He volunteered in 1943 and joined the US Army Air Force as a cadet. 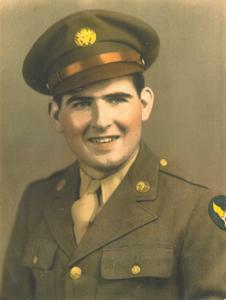 In 1944 he was commissioned a 2nd Lt. and earned the “Outstanding Soldier” award for his graduating class. He was assigned to the 20th Air Force as a Bombardier on a B-29 and was stationed on Tinian Island in the Marinas group. Bill flew 10 bombing missions over Japan. On August 4, 1945, a memorable day in history, he was returned to the US for lead crew training. A few hours later The Enola Gay took off from Tinian Island headed for Hiroshima. After this specialized training was completed the war ended. Bill declined two offers to remain in the service and continue his education “in-grade”. He received an Honorable Discharge but was recalled to active duty during the Korean Conflict. Bill had joined The Upjohn Company in 1941 in Minneapolis, MN and returned to the company as a “Management Trainee”. It was here that he met Betty Johannsen, a new Upjohn employee who later became his wife for over 56 years. They both transferred to Chicago in late 1947 where Bill had been promoted to Credit Manager for the new Chicago branch. Betty and Bill married in 1949. In 1950, Bill was recalled to active duty during the Korean Conflict and returned to civilian life July 4, 1952. In 1954, he was promoted to Branch Office Manager for the new Denver, CO branch. In 1956, he opened the company’s Cincinnati, OH branch. In 1962, he was promoted to Assistant General Branch Office Manager and moved to Kalamazoo. In 1969, he was again asked to move to Los Angeles, CA to manage the company’s West Coast Laboratory Operations. In 1972, he returned to Kalamazoo and in 1976 was promoted to Director of the company’s Domestic Distribution Centers. He retired in late 1984 after nearly 43 years of service. He and his wife Betty retired to Florida to play golf, bridge and do selective traveling. Bill led a very active life as not only did he dedicate himself to his job, but he also found time to actively participate in professional, civic and church activities. He and Betty were members of St. Monica Catholic Church, the Kalamazoo Country Club and the Caloosa Country Club in Sun City, FL. In late 2001 they returned to Kalamazoo and became members of St. Joseph Catholic Church. Bill was preceded in death by his wife, Betty in 2005. Bill is survived by his children: Steven (Kathryn) and Lynn (John) Phillips. He is also survived by grandchildren: John (Shayna) Barry, Patricia (Scott) Williams, Michelle (Jeff) Bingham, Melissa (Jake) Neal and Barry Phillips; and 10 great-grandchildren. Mass of Christian Burial will be celebrated at 11 AM on Monday (Nov. 6) at St. Joseph Catholic Church, 936 Lake Street; Kalamazoo. Immediately following the mass, food and fellowship will be shared in the church hall. Interment will be at Ft. Custer National Cemetery. Memorial contributions may be made to St. Joseph Catholic Church . Please visit Bill’s personal web page at www.BetzlerFuneralHome.com where you can archive a favorite memory or photo of him and sign his online guestbook.